Since we moved to the mountains of Jalisco, “the most Mexican of Mexican states”, I have no excuse for not getting salsa on the table pronto. Salsa may be the accompaniment to almost everything served on a Mexican mesa. And isn’t bottled salsa more popular than catsup in the U.S. now? Cook’s Illustrated, that wonderful food magazine, did a review of bottled salsas a number of years ago and concluded that, really, while some commercial salsas are acceptable, nothing compares with home made salsa. And almost nothing is easier. If you aren’t making it regularly, we’re revisiting salsa to break down any barriers that make you reach for the bottle on the grocery shelf instead of making it yourself. To begin with, you don’t need a recipe, scales or measuring cups. A grill helps, but isn’t necessary. A blender makes quick work of the job, but a sharp knife will also do nicely. If you insist on a recipe, go back to previous salsas from Cooking in Mexico — Salsa Ranchera, and Salsa Verde, to get some idea of the taste you are after and the quantities of each ingredient. A few weeks ago, I had some tomatoes that had been around long enough to become over-ripe. Deep red, with a few wrinkles, a little soft. 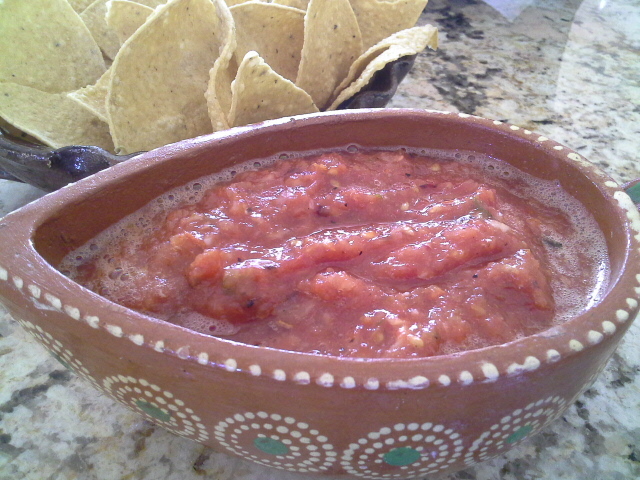 They made the best salsa I’ve had in a long time, with an intense tomato color and flavor. 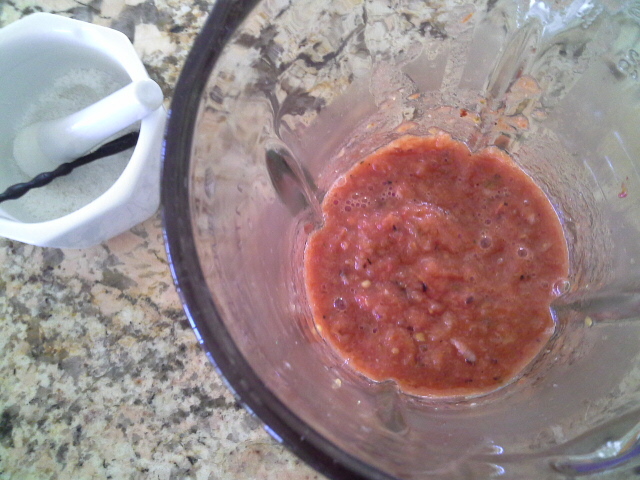 Lesson learned: use over-ripe tomatoes, not those that that come home insipid, pale, and firm. Tomatoes have the wonderful ability to continue ripening the longer they sit around, provided they are not refrigerated. 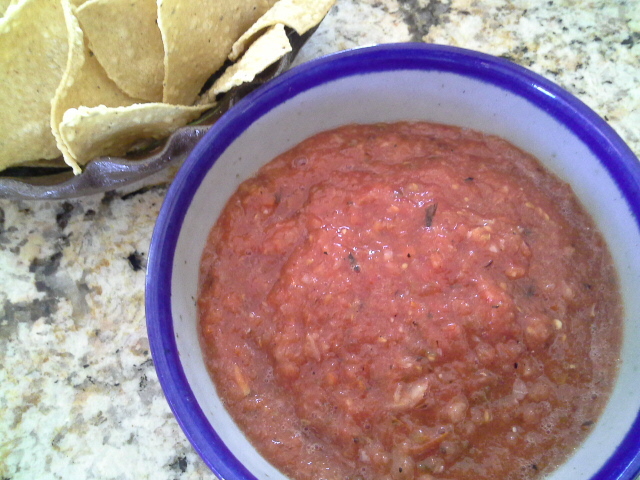 Now I let tomatoes sit on the counter as many days as it takes for them to be almost too ripe, but just right for salsa. Yesterday we stopped at a little tienda in Mascota for tomatoes and cilantro to go with the grilled chicken and tortillas we had just bought. (Alejandro and Ana sell the best charcoal grilled chicken every Sunday out of their house.) The freshness of these tomatoes was questionable, but I had such a hankering for tomatoes, I didn’t care. 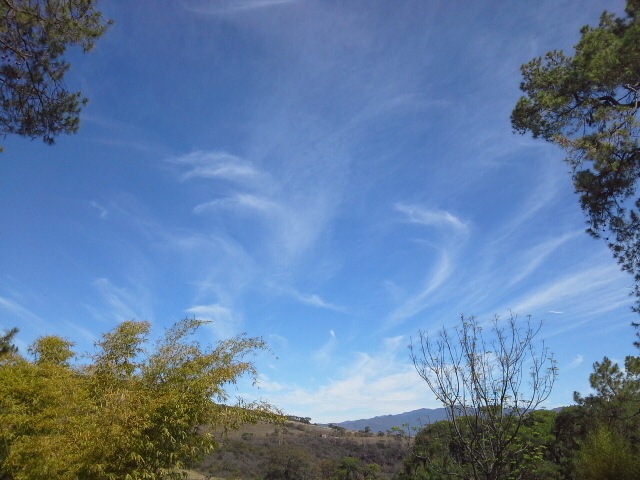 This morning the remainder continued to ripen, getting softer by the minute. Salsa time. #1. 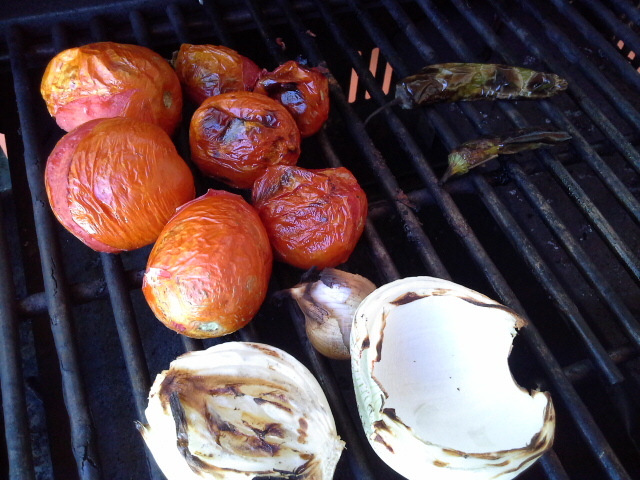 Grill the veggies (tomatoes, onion, chile and garlic) until soft and starting to blacken, then process in a blender. #2. Char the veggies in a skillet on the stove, process in a blender. #3. 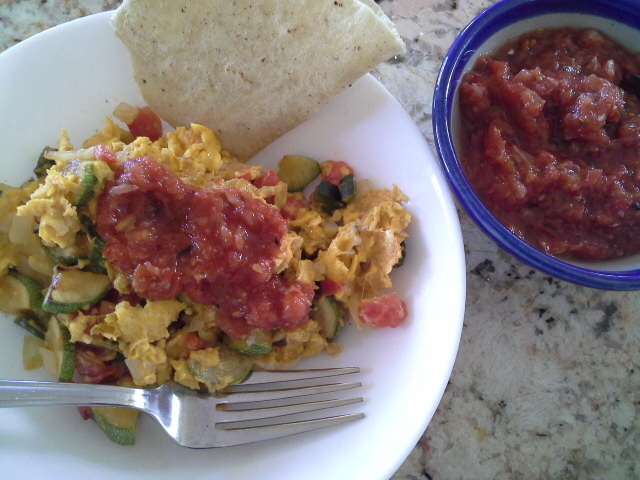 Finely chop raw veggies, and serve salsa uncooked. #4. Process in a blender until slightly chunky, then sautée in a skillet with a little oil. Using the same ingredients, each will produce a slightly different salsa, each method is used in Mexico, and each is delicious. Regardless of your choice, don’t skimp on salt. 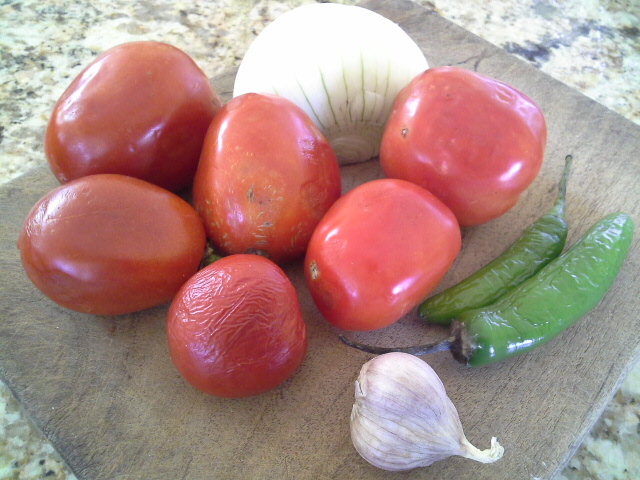 For a no-recipe salsa (or sort of recipe, I guess, because I’m giving you approximate amounts), use 3-4 large roma tomatoes, or more if they are smaller, half an onion, 1-3 serrano or jalapeño chiles, and several cloves of garlic. I prefer method #1 above, because I like the blackened bits grilling produces. 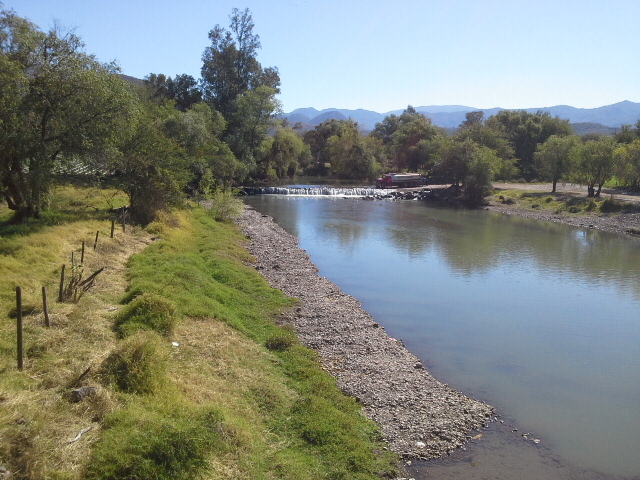 Plus, I have a great view from the grill. If you aren’t up to grilling, just chop everything finely for a fresh salsa. Or throw in the blender and process until still a little chunky, and then sautée in a very hot skillet with enough neutral oil to cover the bottom of the pan. Cook for 5 minutes, stirring. With any of the four methods, use a little bit more salt than you think you should. That’s it. Be sure to have a big bag of corn tostadas on hand for dipping, or serve salsa in a dish along side tacos, Huevos a la Méxicana, grilled meat, you name it. Mario, our yard guy, jack of all trades, and friend, sat down to dinner with us recently. His eyes lit up when I put a bowl of salsa in front of him. He proceeded to smear salsa on hot corn tortillas, fold and eat them in quick order, calling them “Tacos Catalina”, Catalina being the name my Mexican amigos use for me. It was a seal of approval from him. I knew my salsa was bueno. Seed chiles for less heat. Use one chile to start with. It may be so hot that you won’t need to use more. For grilling, pre-heat the grill, then wipe with an oiled paper towel, holding it with tongs. As the vegetables start to char, remove from the heat. The chiles will blacken first, the onion last. Don’t discard the blackened skin (except for the garlic). It adds a charred flavor that no store-bought salsa can duplicate. If you choose grilling, don’t separate the cloves of garlic. Leave them together in their husks to prevent their falling through the grill. When blackened and soft, squeeze out the pulp and discard the skin. For fresh, uncooked salsa, add some chopped cilantro.